GBC = Gamblers’ Book Shop. Worst acronym ever? They have a podcast now. In fact it’s been going for a few months but as usual I’m playing catch-up. This was a little gem back from episode #2 when celebrity bookshop owner Howard Schwartz (he thought I was from Pennsylvania) asks Vegas old-timer Sam O’Connor what he thinks about Omaha poker. "Well it seems like a gamblin’ game to me". I’m not particularly surprised. I’m only part way through O’Connor’s book, Just Sit Tight and Wait For The Nuts, but it’s already in great shape to be the nittiest poker strategy I’ve ever read by a mile. Unfortunately I’ve had to change my travel plans for December. At least that’s what I need to tell the Gold Coast, where I’m currently booked in for eleven nights over Christmas and New Year. Their rate was a pretty good deal, but somthing better just came along. Twice. Thanks to Claire’s video poker play in the summer, she’s scored five free nights in total for the next trip – with no further obligation to meet any play requirements at those casinos! 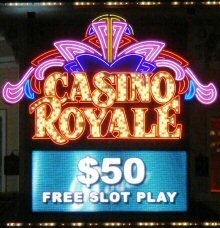 We’ll begin with three nights at Casino Royale. Claire had done her research and found out that a little video poker play on a 99.5% machine was usualy enough to get some room offers, and indeed it was. It’s a sickly sweet sugary smelling dive (you really have to try not to inhale as you walk past Ben & Jerry’s in the tiny entrance hall) but it’s a decent location right next to The Venetian. The only game worth noting there is craps with 100x odds, which is great if you’re in the mood for putting $5 on the line and $500 behind. That’s not really for me – if I had $500 to play on dice, I’d want to spread my money around on more than one roll. 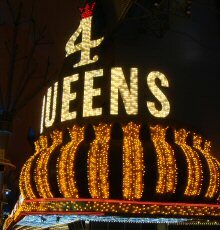 Then it’s off downtown for two nights at the Four Queens. It’s also nothing special, but also a decent location – about 30 seconds walk from all the other downtown casinos – and it does have plenty of 100%+ payback video poker to qualify for next trip’s room offers! I can’t even remember the last time I watched football, but I was betting on it at the weekend thanks to a Sporting Index "safety net" promotion. The deal: lose up to £50 over the weekend and get your money back on Monday. This is a great promo, almost the same as a free £50 fixed odds bet if you use it well. To get maximum value, you have to find a single spread bet with a fixed downside and a reasonable upside. If you play volatile spread markets, there’s the risk that you could lose much more than £50, or win or lose a only few quid which makes the refund hardly worth having. Not that I’m complaining, but I’m sure this promotion must actually discourage action. Even for a genuine bettor, if you lose a bet early in the weekend and are guaranteed £50 back on monday morning, in effect you have to win that £50 on your next bet before you can take any profit from it – so why bother trying to win it back when you can just sit tight and wait for the refund? I backed Norwich City. I can’t remember who they were playing, and I didn’t particularly care. I wouldn’t have been any more likely to make a better decision if I’d considered the game. I’d realised it was already Sunday and opportunities to use this free bet were running short, so I jumped in and bought their win index at 11.5 for a highly suspicious £4.34 per point. The "win index" on a football game awards 25 points for a win, 10 points for a draw nothing for a loss. So if Norwich lost, my total loss would be 11.5 x £4.34, a fully refundable £49.91. If they won I’d be looking at a nice little profit of £58.59. In fact the game was a draw, although I only saw my bet result not the game result, and I just wasn’t interested enough to look it up. It was a small loss of £6.51, but because the safety net promotion covered net losses from the whole weekend I got to have another go. This time I bet against West Ham. They were playing some other team that I don’t remember, and I only know that it was West Ham because it says so on my bet result. I just went for whatever game was on TV at the time. It was about 30 minutes into the match and they were a goal up, so I could sell the win index at 19 for £7.30 per point – slightly less suspicious, but it’s still pretty obvious what I’m up to if they care to look! Worst case, if West Ham stay ahead and win, I’d be down another £43.80 – with the previous loss that’s just a few pence more than the refund limit. If they give up a draw, I’m up £65.70 on the bet and if they manage to throw it all away for me, I’d be counting £138.70. Worth a random punt for sure. Another draw, and I’m £59.19 up on the day. Result! It’s a day late I know but I only got this email this morning and I just couldn’t resist one more fabulous picture of Mr Terrible going "awoooooo".